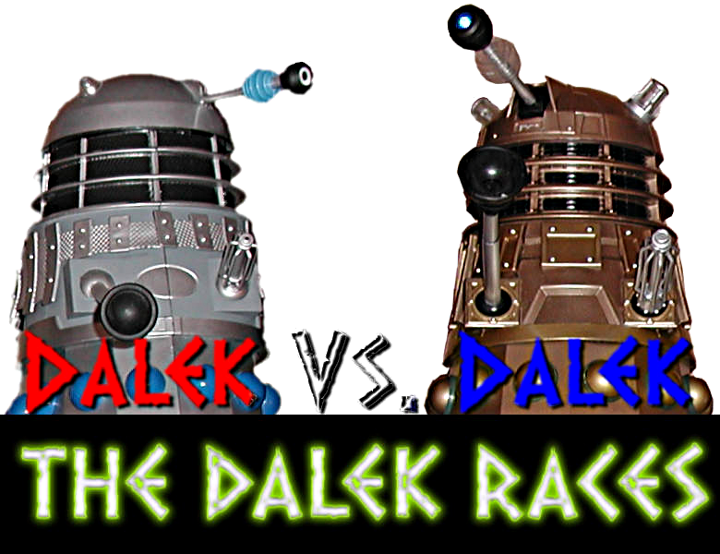 Welcome once again to the Dalek Races! This year we have a real treat for you in store. 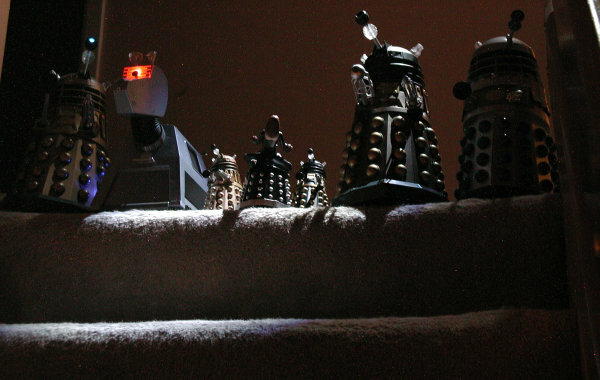 Both of last years finalists are joined by a host of new contenders for the crown of Top Dalek! Yes, we too are amazed that even more have made it through to this final. Some say this is a tribute to the fact the Random Extermination round has been retired. 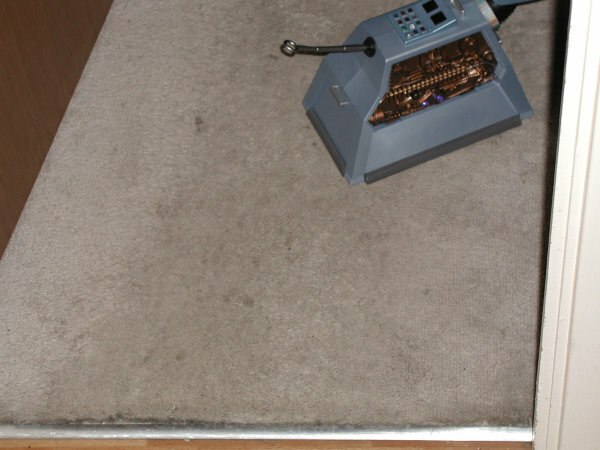 Yes, we are as disappointed as you on that - no more Special Weapons Daleks transmatting in, without notice, to blow everything away. Who'd have thought the Alpha Centauri government would have minded losing their spectating delegation like that? Still, it means we have more than ever for this, what is sure to be, spectacular final. I can see the contenders lining up for the first event. 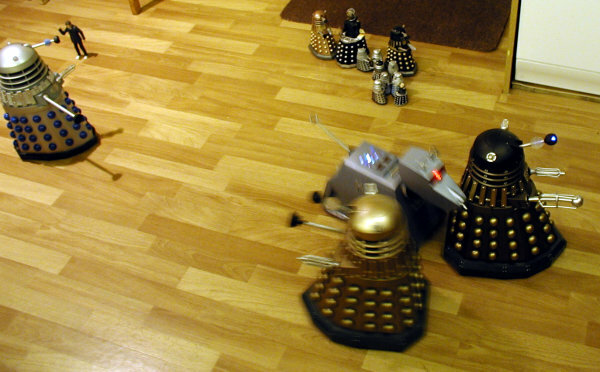 Yes, we can see there K-9 - the first time a non-Dalek has made the finals - along with Imperial Guard Derek, last years winner Wayne Dalek and last years runner up Dezmond T Dalek. Let's hope we don't have a repeat of the events at the award ceremony this time. In fact I think we can see, yes, at the end there is our special guest judge - The Doctor! He will be sure to prevent Wayne and Dezmond jumping out of their cases and tentacle whipping each other in rage again. That was an ugly moment indeed. Yes, that's him, The Doctor. 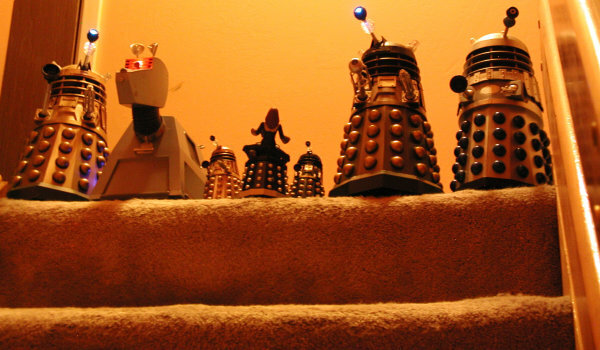 You can almost smell the seething hatred pour off those Daleks from over here. Even K-9 appears to be turning his nose up at his former master. 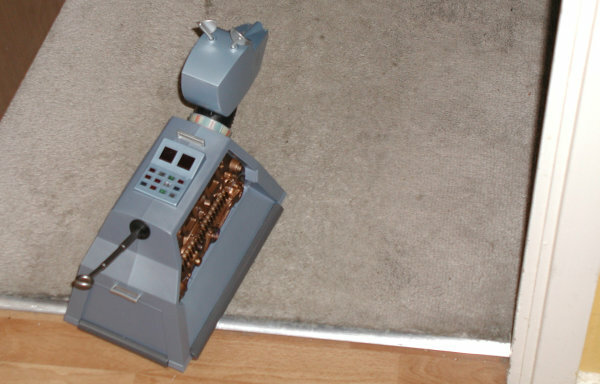 Perhaps those rumours of the various K-9 units getting together, to bring abandonment charges against the Timelord, are true. 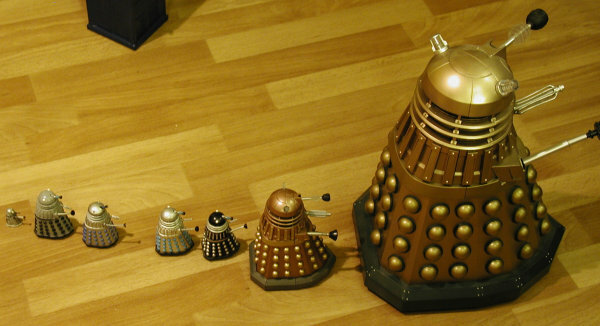 Oh my giddy Dalek aunt! K-9 has immediately veered off in front of the other contestants. Could this be blatant cheating on the robot dog's part? Or is he going after the Doctor? If only I could cover my eyestalk - I don't think I want to see this! It's all a blur as Wayne speeds to victory! Dezmond has realised he's been left for dead and attempts to get into the race but Derek looks more interested in showing off his big weapon to the crowd! Wayne has won but what's this? K-9 has turned around and is having a pop at the spectators! Ref! No, the Doctor is just looking on and chuckling to himself. Dezmond is stunned by this turn of events and is just looking on! Come on Dezmond - you could still get second place... No, Derek has seen the opportunity... Now Wayne is coming back up the track! What is going on?! 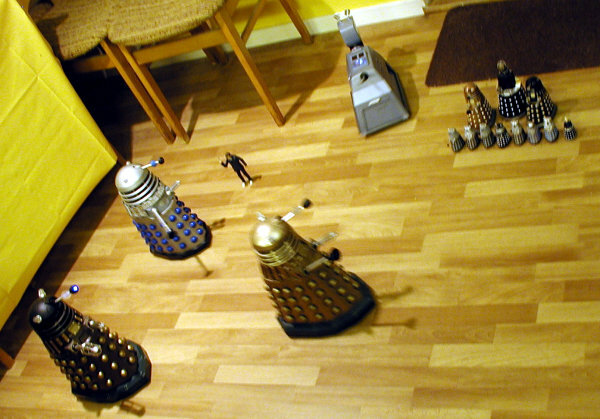 I haven't seen such a mess since the last Dalek Mutant Mud Wrestling Championship! K-9 is kicking in the sideline spectators good and proper! Wayne has picked a fight with newcomer Derek, too! It's madness out there and the rest of the crowd is loving it! Ouch - that must really smart, Doctor! 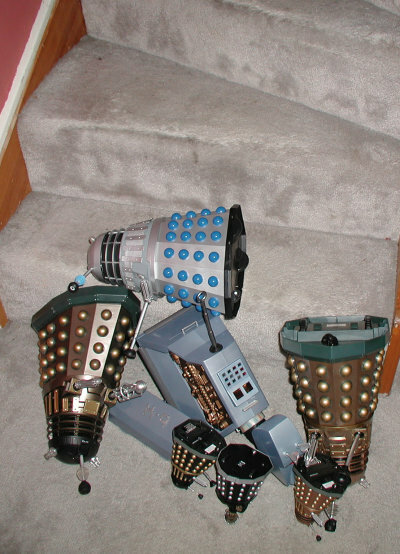 Now Wayne Dalek has ex-ter-min-ate-d the judge. Remarkable! You just can't buy good quality violence like this! 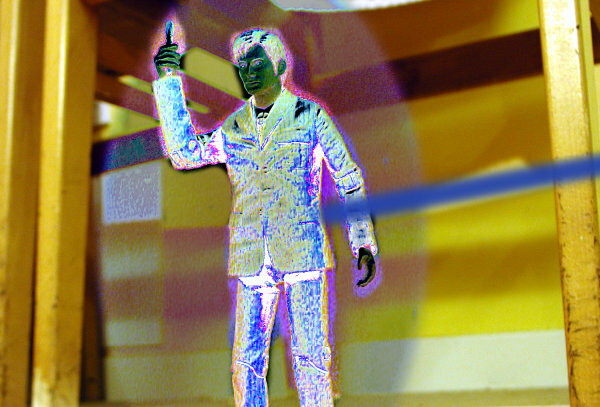 And now Wayne is lording it over the lightly steaming remains of the Timelord! 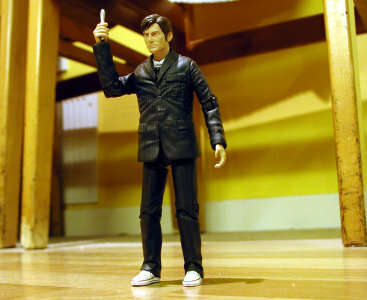 Let's see you regenerate from that one, Doctor! If that wasn't enough, Wayne has brought his family in and they've started a Conga Line! He thinks he's got this one sewn up again and who are we to argue with a gloating Dalek in his bling casing? Now everyone has calmed down... Onto the next round... The Doorstep Challenge! What's this? Davros has ranted like the madman he is and scared off both Derek and Dezmond, only to take their places in this new round. If only there were a judge on hand to stop him. No, I can just about see that The Doctor is indeed still dead - in fact some enterprising mutants are chopping him up and putting the bits in jars of bubbling blue liquid. Looks like it's dBay for him! 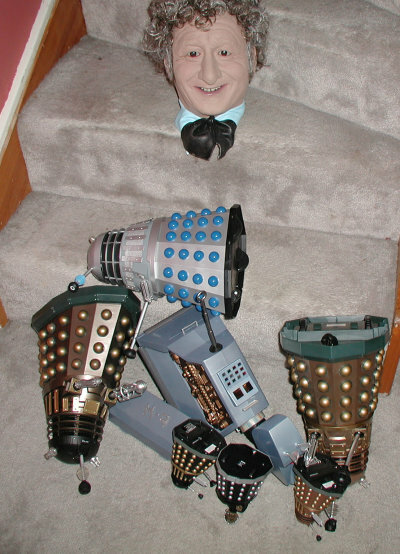 It appears Davros is stuck, though! He may have bullied his way into the final but it hasn't done him any favours. 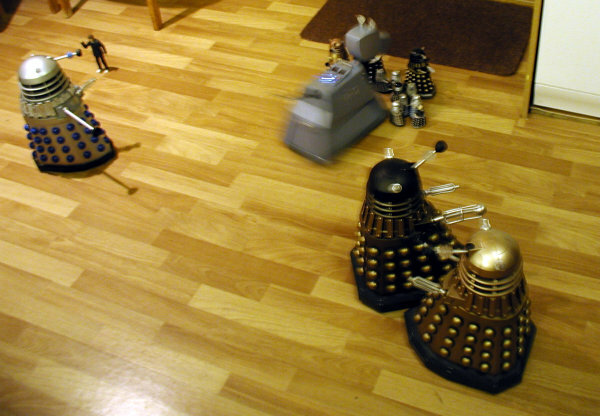 Come on, peddle harder Davros! Next up we have Wayne. If you remember he failed this event last year and... he doesn't appear to be doing any better this time. Come on, get those pathetic little casters over that lip! You can just see he wants to hover over that but he'd be disqualified immediately. Imagine the rampage that would create. Come on Wayne, just a little hover to entertain us with your murderous ways... No, he's given up. Poor show from the reigning champion. K-9 is our last contestant for this Doorstep Challenge, then. 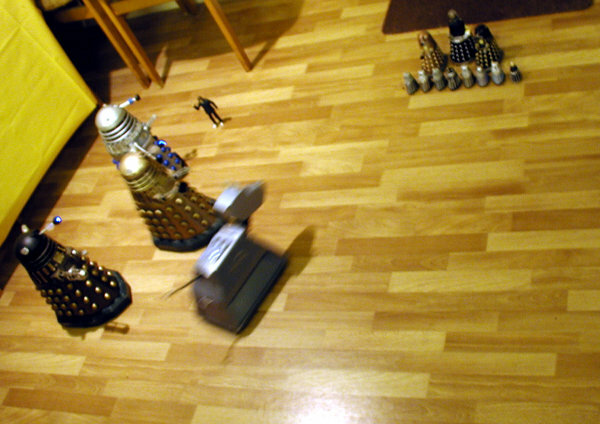 Can this newcomer beat a Dalek? He's rutting back and forth on that lip - is he stuck or just enjoying himself? Oh my word! He's done it! K-9 has won the Doorstep Challenge! Jill Dando would be proud! 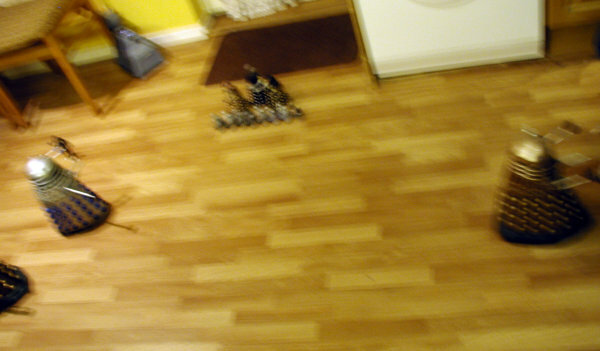 He's now doing a victory lap over the carpet just to show he's the ruler of the robots! Oh, well, there we have it, I suppose. We have a new champion - Wayne has been defeated! What's that our winner is saying? Something about using the prize money on dBay..? It just goes to show, if you want to get a head in this game - go to the professional!